"I saw firefighters falling out of the trucks, bleeding." 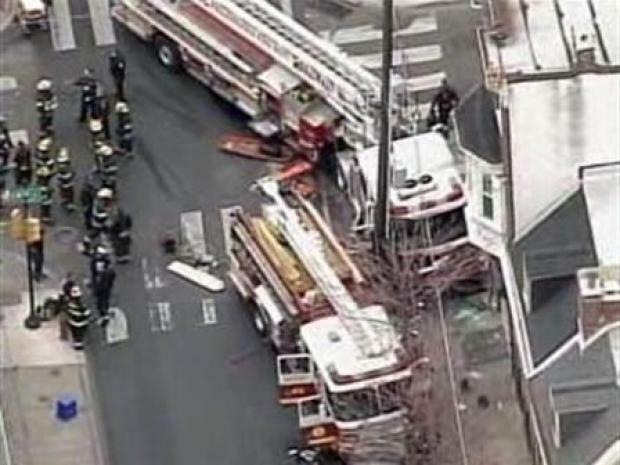 Two fire trucks crashed at 8th and Lombard on Thursday. Flower shop owner Carlos Cedrone said it sounded like an explosion. A false alarm. 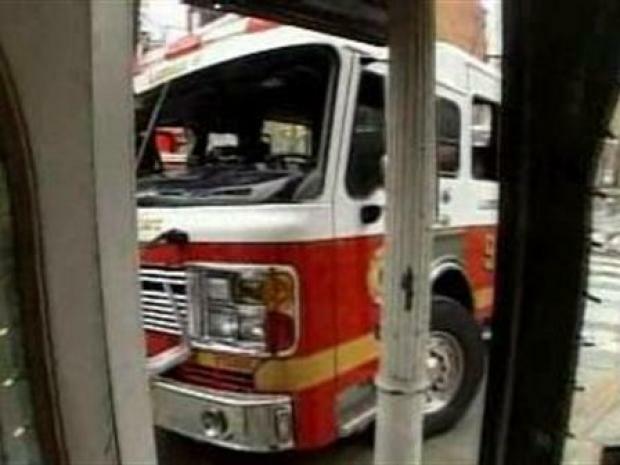 That's what two fire trucks were racing to Thursday morning when they crashed in Center City. Nine firefighters and one civilian were taken to local hospitals. "I heard this humongous bang and I looked up and saw these two HUGE trucks almost in my building," said a shop owner in the neighborhood of 8th and Lombard Streets. Shop owner Janet Alverez was so shaken up by the fire truck crash that she wound up in the hospital. The trucks were on their way to fight a reported fire at 22nd and Warren Streets when the accident happened around 11:20 Thursday morning. The fire call turned out to be a false alarm, according to sources. Get the details on the firefighters and flower shop owner who were injured in the crash. Luckily none of the injuries seem life threatening. Both trucks entered the intersection at 8th and Lombard at the same time, investigators believe. The Fire Commissioner speculated the trucks sirens were so loud neither could hear the other. Ladder 9 slammed into a telephone pole with such force, it severed the pole. Engine Company 43 was also involved in the crash. Both fire trucks are stationed at 21st and Market Streets. Hear from the owner of the small Philadelphia flower shop where the crash happened. Carlos Alverez, who owns Cedrone's Flowers said it sounded like an explosion. He ran out to see what had happened "and all the windows were blown out. When I looked, I saw firefighters falling out of the trucks, bleeding." "I heard this ungodly crash," said Alverez's wife Janet. She was in the store at the time of the crash and went to the hospital due to the distress of the crash. Video shows a firefighter climbing up inside the front bed of one of the trucks to help rescuing one of the injured firefighters. Other firefighters were scrambling to rescue the injured. Most of the hurt were taken to Hahnemann University Hospital. They were all treated and released. "We are fortunate that no loss of life to our firefighters or the public occurred as a result of this accident," said Fire Commissioner Lloyd Ayers. Five firefighters from Ladder Company 9 suffered injuries. The injured were Lt. Richard Prather, FF Anthony Russell, FF Charles Green, FF James Hegarty and FF Donna Garrett. 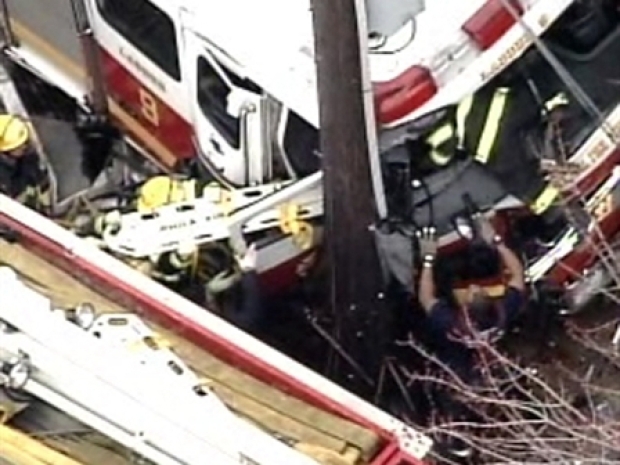 Four firefighters from Engine Company 43 suffered injuries. The injured were Lt. Steve Kessler, FF Shawn Conway, FF Keith Davis and FF David Keller. The intersection was cleared and reopened Thursday night. The cause of the crash appears to be accidental, investigators said.